Our oceans are at risk from oil companies and politicians trying to expand offshore drilling to treasured places where drilling doesn’t belong. Currently, the Trump Administration is proposing to expand offshore drilling to about 90% of the country’s ocean areas, a move that is severely misguided and unnecessarily compromises the environment and economy of much of our coast. 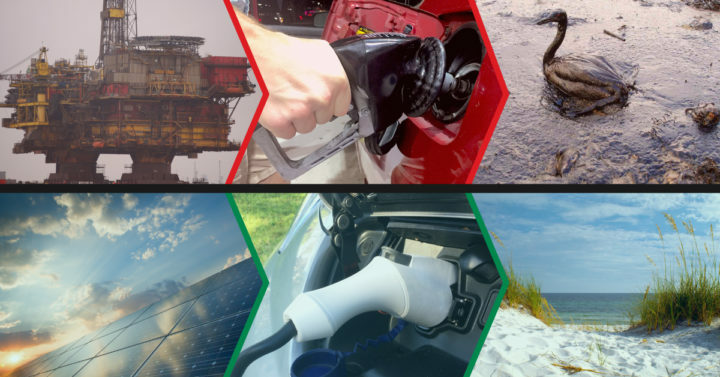 Thankfully, transitioning America’s vehicles to electric vehicles can help protect our coasts by reducing oil demand and thereby dampening any perceived–however false–benefits of drilling. In fact, we calculate that if 20-45 million people switched to electric vehicles by the early 2030s, it could offset any oil used to make gasoline from the currently protected areas of the Atlantic, Pacific, and Eastern Gulf of Mexico combined. Reaching this goal is entirely feasible, but it will require good policy and consumer education. How Much Gasoline Could Be Produced by Opening Protected Offshore Areas? This map shows the areas proposed for offshore oil and gas development by President Trump. The dates indicate the years in which lease sales will be held for those areas. The Trump Administration is proposing to open nearly all of our country’s oceans to offshore drilling, even though the risks far outweigh any potential benefits. Furthermore, the vast majority of U.S. offshore oil is already available in areas where drilling is already occurring. Adding many new areas would add relatively little new potential for oil production. To estimate how much oil the currently protected areas might feasibly produce under foreseeable price scenarios, we take a very conservative approach by assuming $100/barrel oil throughout our 20-year analysis period from the early 2030s to the early 2050s. According to the Department of Interior, at $100/barrel, the currently protected areas are estimated to contain about 14.4 billion barrels of undiscovered, economically recoverable oil. To put that in perspective, given the current oil consumption rates in the United States, the currently protected ocean areas would contain only about two years’ worth of oil supply, though in reality, oil production from new offshore areas would take decades to fully develop. 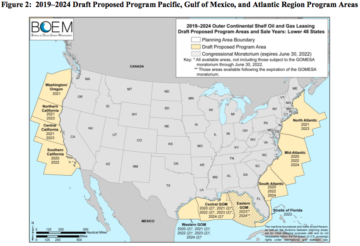 If the currently protected areas were to be opened to offshore drilling, it would take a minimum of 10-15 years to begin any potential oil production, according to industry estimates, which means that if the Trump Administration’ currently-planned lease sales in 2020-2023 were carried out, the earliest any oil might be produced would be the 2030-2038 range. For the purposes of this analysis, we have assumed full production of all economically recoverable reserves at a constant rate over 20 years from the early 2030s to the early 2050s. With these assumptions of price and timing in place, we can calculate that 14.4 billion barrels of oil produced over 20 years would yield about 720 million barrels of oil per year. Each barrel of crude oil would yield about 21 gallons of gasoline after refining, meaning that the currently protected areas would yield about 15 billion gallons of gasoline per year for 20 years. How many EVs would it take to offset 15 billion gallons of gasoline per year? To find out how many EVs it would take to offset 15 billion gallons of gasoline per year, we calculate how much fuel is currently used by vehicles on the road, which would be replaced by EVs. EIA reports that light-duty vehicles (cars and trucks) on the road today get about 22.98 miles per gallon (MPG), however for this analysis, we perform a sensitivity analysis, assuming 20 MPG, 25 MPG, and 30 MPG. EIA reports that the average driver drives about 12,800 miles per year, while the American Automobile Association reports that the figure is 11,498 miles per year. For our analysis, we look at 10,000 miles driven per year, 12,000 miles driven per year, and 15,000 miles driven per year. Using these variables, we find that vehicles currently on the road use about 333 gallons of gasoline per year (high efficiency, low-mileage vehicles) to 750 gallons of gasoline per year (low efficiency, high-mileage vehicles). Therefore, it would take 20-45 million EVs replacing current gas-powered cars on the road from the early 2030s to the early 2050s to offset all of the gasoline that could be produced from the currently protected areas of the Atlantic, Pacific, and Eastern Gulf of Mexico combined at foreseeable oil prices. Is 20-45 million EVs by the early 2030s feasible? Deployment of 20-45 million EVs by the early 2030s is entirely feasible, but it may require consumer education and good EV policy adoption. 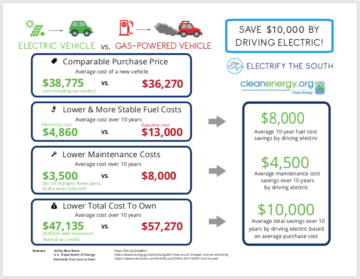 Investigate how driving an EV can save you $10,000 over 10 years. This rapid growth will be prompted in large part by cost reductions in electric vehicles. While EVs already cost less than conventional cars to operate and maintain, their initial purchase price is slightly higher on average than conventional gas-powered vehicles. Because EVs cost so much less to fuel and maintain than conventional cars, EVs bought today are estimated to save their owners $10,000 over ten years of ownership. Yet even their initial purchase price is expected to fall to less than the initial purchase price of conventional gas-powered vehicles in the next 5-10 years, meaning savings from Day 1 and then thousands of dollars of additional savings over years of ownership. But not all projections of EV sales are so optimistic. For example, EIA estimates that EVs will comprise just 9% of light-duty vehicle sales in 2030 and 17% in 2050, meaning about 20 million EVs on the road in 2035 and 39 million in 2050. The difference between achieving the goal of 20-45 million EVs on U.S. roads and the low-end projections could be attributed to several factors that could be potential challenges to widespread EV deployment, including: consumer awareness and acceptance, availability of charging infrastructure, level of participation by electric utilities, governmental policies, technological development and adaptation, and economics of energy storage. Consumer awareness and good policy adoption can mitigate some of these potential challenges. We find that if 20-45 million people switched to electric vehicles by the early 2030s, it could offset any oil used to make gasoline from the currently protected areas of the Atlantic, Pacific, and Eastern Gulf of Mexico combined. There is no need to compromise our pristine areas with unnecessary oil drilling. We need to ensure that offshore oil development does not take place in currently-protected areas. The importance of protecting our treasured coastal places only grows as projections for oil demand diminish, meaning any new offshore oil infrastructure could become long-lived sources of pollution for a potentially very short period of oil production. To ensure protection of our currently-protected coasts and offshore areas, we should act to proactively accelerate our clean, electric vehicle future. The goal of offsetting any potential gasoline production from our treasured, protected offshore areas by deployment of EVs is entirely feasible, if not likely. But it should not be understood as a given that the goal will be achieved before oil production could begin in the early 2030s. To make sure that we reach such a deployment goal, we must all do our part–through purchasing decisions and policies–to accelerate our clean EV future. ¹ Source: U.S. Energy Information Administration 2019 Annual Energy Outlook, Oil and Gas Supply Module. https://www.eia.gov/outlooks/aeo/assumptions/pdf/oilgas.pdf/ EIA calculates 12.3 billion barrels of undiscovered technically recoverable oil in the Eastern Gulf of Mexico, Atlantic, and Pacific combined out of a total 302.5 billion barrels of total national technically recoverable resources onshore plus offshore. 12.3 billion/302.5 billion = 4%. ³ Oil price forecasts are in today’s dollars. The World Bank forecast is for average crude oil while the EIA forecast is for Brent crude. The EIA also forecast the price for WTI crude at $68/barrel in 2018 to $87/barrel in 2030 to $105/barrel in 2050. ⁴ These EV deployment estimates are inclusive of both BEVs (battery electric vehicles), which are fueled exclusively by electricity, and PHEVs (plug-in hybrid electric vehicles), which sometimes run on electricity and sometimes run on a combination of electricity and gasoline. Most sales forecasts show BEVs dominating the EV market in years to come.